Mix mew with (kan)garoo and what do you get? 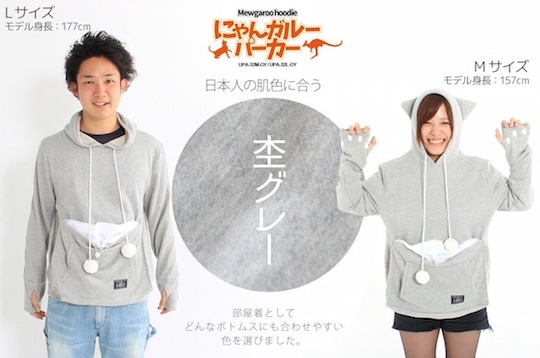 The Mewgaroo Dekapokke Hoodie (Dekapokke means "Big Pouch"), a clever combination of sweatshirt and pet carrier that keeps your cat or small dog as close & cozy as a Mama 'Roo and her Joey. 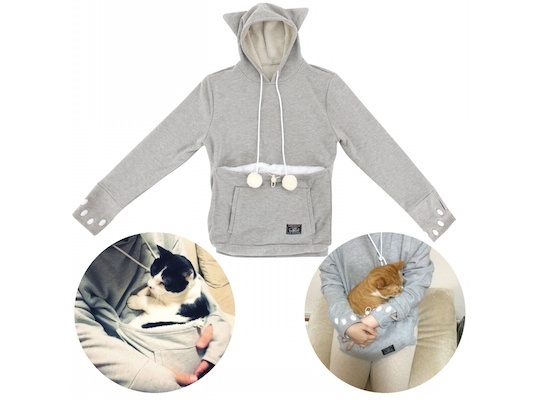 If your cat is the clingy type, they'll appreciate your Mewgaroo Dekapokke Hoodie for bringing you closer than ever before. Even small dogs will love the chance to get extra up close & personal with their human companions. 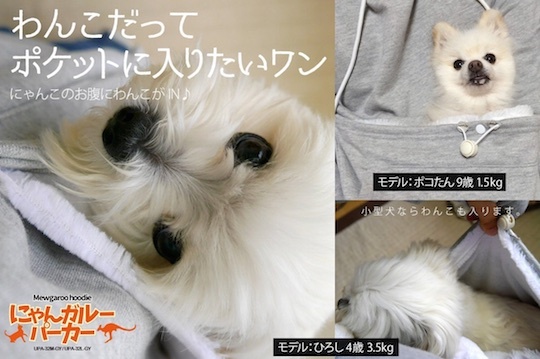 Indeed, the garment's spacious built-in pouch takes snuggling in a pet owner's lap to the next level! Now you can work, play or even take a catnap with your furry friend securely settled in and free from fears of falling. Felines not quite ready for slumber time can amuse themselves playing with the pair of soft fuzzy balls dangling off each drawstring. 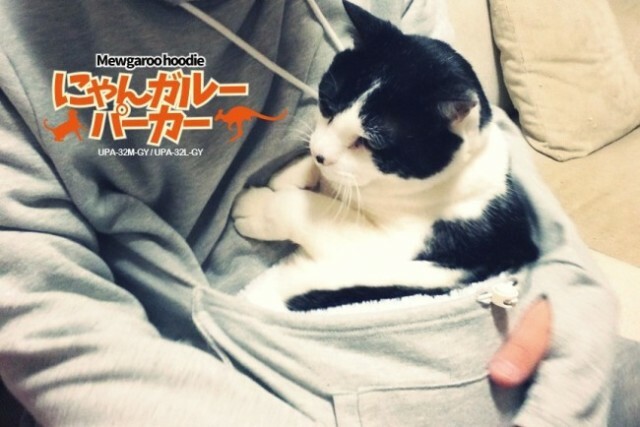 The Mewgaroo Dekapokke Hoodie is the cat's pajamas in other ways as well. The sleeves end in integrated demi-gloves that keep fingers warm while computing on cool nights. The gloves are decorated with white cat-paw markings and the hood (on size Medium shirts only) includes cute nekomimi (cat ear) extensions. 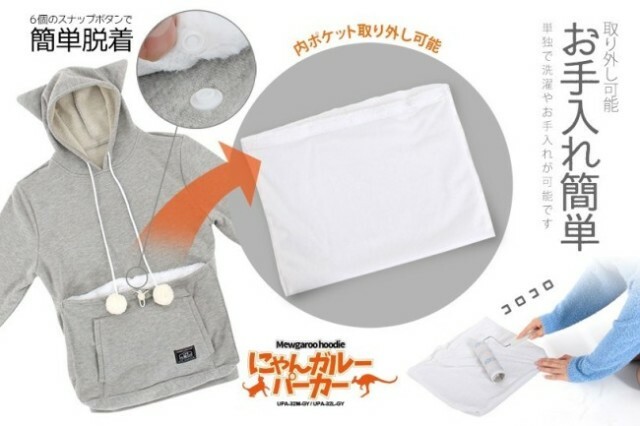 But back to the Mewgaroo Dekapokke Hoodie's most salient feature: the pouch. While the sweatshirt itself is made from 65% cotton and 35% polyester, the pouch's inner pocket is 100% polyester for improved durability. Both the shirt and the pouch are machine washable and the pouch's lining can be removed and washed separately as required. As only limited quantities are available, the Mewgaroo Dekapokke Hoodie is currently listed but may be marked SOLD OUT. For more details, please visit the OMG Japan product page – both Medium and Large sizes are priced equally at $70 each.